Waste Management is committed to providing reliable collection for all customers. We are also committed to the safety of our drivers and customers. Weather conditions may delay collection times. Please leave containers out until 6 PM. If service is postponed, we post updates here, and call customers as needed. We appreciate your understanding and cooperation as we manage weather-related service challenges. If your area is not listed below, and your garbage or recycling has not been collected by 6 PM, please report the missed collection here. There are no weather related service interruptions at this time. Waste Management is committed to safely collecting garbage and recycling as conditions permit. We appreciate your cooperation when weather conditions interrupt your regular service schedule. 32-gal. can with handle and lid (65 lb. limit) labeled "Garbage"
32-gal. can with handle & lid (65 lb. 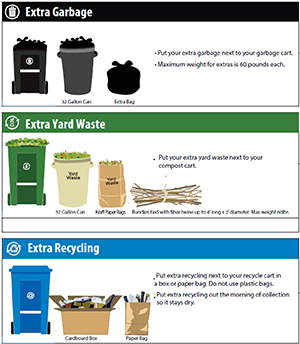 limit) labeled "Recycling"
Commercial locations will be serviced as soon as conditions allow safe collection. Priority service is given to locations such as hospitals and restaurants, where public health is a concern. If you need to dispose of your garbage and recycling sooner than Waste Management is providing service in your neighborhood, you may consider taking accumulated garbage and/or recycling to a public transfer station in your area, where garbage will be accepted for a fee. No Credit for Weather Interruption: Because we still incur the costs of collecting and managing your garbage and recyclables, we do not provide credit for weather-related postponed collection. However, we accept up to twice as much material at no extra cost on the next regularly scheduled collection day for each container.